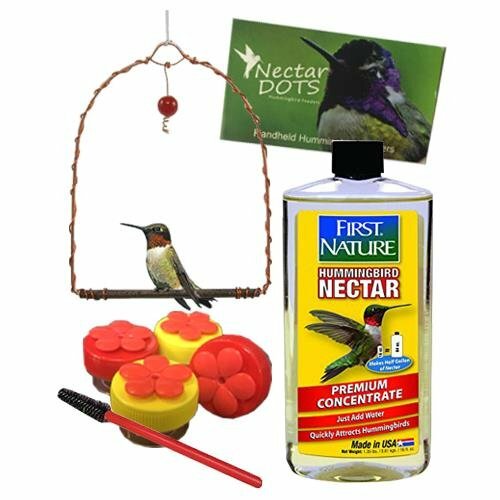 1 Port Brush Now you can hand-feed Hummingbirds with Nectar DOTS! Each DOT holds a quarter ounce, or 1/2 Tablespoon, of nectar. Simply fill the DOT with nectar and place near an existing Hummingbird feeder. After you notice the Hummingbirds using the Nectar DOT, stand near the existing feeder and hold the Nectar DOT in your hand. Once the Hummingbirds have gotten use to feeding from your hand you may move to your chosen location. Wash your new Nectar DOT with a mild detergent and rinse completely. Fill with nectar. (You can make nectar by mixing 1 cup of plain white sugar with 4 cups of boiling water.) Let the nectar cool before using. Extra nectar can be stored in a refrigerator for up to 7 days. Place the Nectar DOT near an existing feeder. Soon, the hummingbirds will start using the Nectar DOT. Remove the existing feeder(s) and hold the Nectar DOT in your hand. To encourage the hummingbirds, wear sunglasses to help hide your eye movements.WOW! You are now hand-feeding a hummingbird! It's that easy! Be sure to clean your Nectar DOT after each use. FEED HUMMINGBIRD FROM YOUR HAND: Learn How to Feed Hummingbirds From Your Hand! Kit includes detailed instructions to help you learn! EASY TO CLEAN: Easy to Clean Kit comes with 4 Nectar DOT Cups! NECTAR DOT CAPACITY: Each DOT holds a quarter ounce, or 1/2 Tablespoon, of nectar. Simply fill the DOT with nectar and place near an existing Hummingbird feeder. If you have any questions about this product by Nectar DOTS, contact us by completing and submitting the form below. If you are looking for a specif part number, please include it with your message.